Leading man Sam Worthington exacerbates the film’s downbeat tone: as Perseus, Worthington remains a credible but basically charisma-free actor. 106 min. Warner Brothers. Director: Louis Leterrier. Cast: Sam Worthington, Liam Neeson, Ralph Fiennes, Mads Mikkelsen, Alexa Davalos, Nicholas Hoult. Long before the Pegasus turns up in a raven hue, the new remake of 1981’s Clash of the Titans is evidently a horse of a different color: darker, that is. Desmond Davis’ original was mostly a sunny affair, which made the shadows-and-hellfire showdown between demigod Perseus and snake-haired Medusa all the more striking, especially as animated under the aegis of special effects maestro Ray Harryhausen. It’s a mark of the remake’s failure that the same showdown is one of the film’s most notably disappointing scenes, rendering the Medusa in the film’s least artful, most weightless CGI (the blah, afterthought 3D is no help). Remake director Louis Leterrier (The Incredible Hulk) has let the darkness spread through the narrative, and mostly bled out what fun there was to be had. 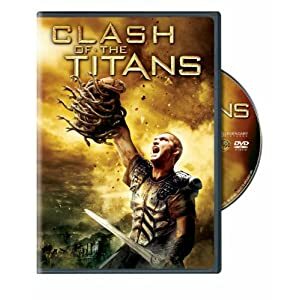 It’s a gamble that could have paid off with a sharper script, but let’s face it: the three screenwriters involved haven’t changed the original that much: Clash of the Titans is still pretty dimwitted and incoherent. The difference now is that it’s lost its camp appeal. Leading man Sam Worthington (Avatar) exacerbates the film’s downbeat tone: as Perseus, Worthington remains a credible but basically charisma-free actor. He has one speed: smolder (okay, two: smolder and sneer) and his humorlessness makes one long for the days when Harrison Ford and Bruce Willis ruled the roost. The broadest strokes of this ancient-times fantasy remain the same, but call it a loose remake: several characters have been added (including Zeus’ jealous brother Hades, played by Ralph Fiennes, and a Legion that seems to have wandered in from 300) and others subtracted (Burgess Meredith’s likably dotty Ammon). The gargantuan sea beast that is the Kraken is still the eleventh-hour showstopper, after a parade of famous monsters of filmland that includes ogre-ish Calibos (Jason Flemyng), giant scorpions, the Stygian witches and Medusa. The remake emphasizes the notion of man going to war with the gods, touching on the philosophical notion that the gods need human worship to thrive and, perhaps, survive. But this provocative idea is quickly lost to muddy motivations (Zeus was always a flip-flopper, but just try to follow his train of thought here) and tiresome action that suffers from a lack of audience identification in a hero who sorta wants to save the day, as long as it doesn’t mean taking any favors from Dad. Principally, Perseus craves revenge against Hades. This puts him only slightly further up the evolutionary scale than the Sodom-and-Gomorrah-style mouth-breathers of Argos, a port town scheduled for heavenly demolition unless they feed their Princess Andromeda (Alexa Davalos) to the Kraken (or as Fiennes, amusingly on his own trip, calls it, “the krah-ken”). This Clash of the Titans does have a couple of saving graces. Liam Cunningham as Legion leader Solon is the film’s unlikely but highly skilled comic relief, and the depiction of mystical Io (Gemma Arterton) harkens back to Homer’s earthbound encounters between men and gods. And if all you’re really after is seeing Liam Neeson’s Zeus, in gleaming white Olympian armor, stare down the camera and intone, “Release the Kraken!” do I have good news for you. 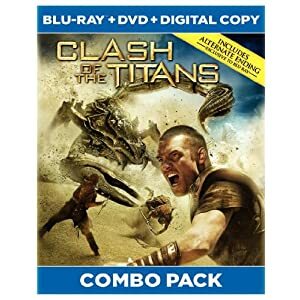 The new Clash of the Titans makes its home-video debut in a snazzy Blu-ray + DVD + Digital Copy special edition from Warner. The hi-def transfer accurately recreates the film's theatrical appearance, warts and all. The iffy contrast and signs of digital manipulation will look familiar to those who saw the film in theaters, but the overall impression is sharp on Blu-ray, with strong detail and true color. The DTS-HD Master Audio 5.1 surround mix is fantastic, with the rear channels frequently roaring to life for an immersive, assaultive effect, and the music and dialogue never feel muddied in the slightest by all the action. WB's splashy Maximum Movie Mode is a deluxe video commentary, here offering enhanced picture-in-picture, enhanced scene breakdowns, enhanced vfx breakdowns, on-the-spot vignettes, and branching "focus point" featurettes with behind-the-scenes footage and cast and crew interviews. The Focus Points (35:02 with "Play All" option, HD) include "Sam Worthington is Perseus," "Zeus: Father of Gods and Men," "Enter the World of Hades," "Calibos: The Man Behind the Monster," "Tenerife: A Continent on an Island," "Scorpioch," "Actors and Their Stunts," "Wales: A Beautiful Scarred Landscape," "Bringing Medusa to Life," and "Prepare for the Kraken!" Interviewees include director Louis Leterrier, Sam Worthington, producer Basil Iwanyk, Jason Flemyng, Liam Neeson, costume designer Lindy Hemming, Ralph Fiennes, make-up and hair designer Jenny Shircore, visual effects supervisor Nick Davis, prosthetics supervisor Conor O'Sullivan, supervising location manager Robin Higgs, Gemma Arterton, location manager Terry Blyther, "Draco" stunt double Mark Mottram, Liam Cunningham, associate producer Karl McMillan, visual effects supervisor for Cinesite Simon Stanley-Clamp, animation supervisor for Cinesite Quentin Miles, stunt coordinator Paul Jennings, Mads Mikkelsen, Alexa Davalos, producer Kevin De La Noy, visual effects supervisor Neil Corbould, production designer Martin Laing, visual effects supervisor for Framestore Tim Webber, Medusa lead modeler from Framestore Scott Eaton, animation supervisor for Framestore Max Solomon, character designer Aaron Sims, animation supervisor for MPC Greg Fisher, CG supervisor for MPC Patric Roos, and visual effects supervisor for MPC Gary Brozenich. "Sam Worthington: An Action Hero for the Ages" (7:56, HD) focuses on the commitment (especially the physical commitment) of the film's leading man. The featurette includes interview clips of Worthington, Iwanyk, Leterrier, Jennings, Flemyng, and Arterton. Next up is a bold "Alternate Ending" (5:23, HD) and nine "Deleted Scenes" (18:10, HD) that intriguingly offer more depth to the characterization of the gods. Lastly, the disc is BD-Live enabled for more content. All site content © 2000-2019 Peter Canavese. Page generated at 04/25/2019 02:47:21PM.